This polymerisation process is of simplest form. In this polymerisation process, a large unit molecule, the monomer, are chemically added to another monomer to form a large chain, the polymer (referring to many parts), which has a number of repeated units, mers. Mers are the smallest units recognizable in the chain. The degree of polymerisation is the number of repeating units that have identical structures within the chain formed by the polymer. Addition polymerisation involves only one type of mer. Such polymerisation takes place by three steps namely. (i) Initiation (ii) Chain propagation (iii) Termination. Example: Addition polymerisation of ethylene. Once the polymerisation process is started, it does not continue indefinitely since it is impossible to link all the monomers in a plastic one long continuous chain. The polymerisation is terminated by a collision between the active ends of two chains or by addition of a terminator, such as free radicals from catalyst. It is another type of addition polymerisation. In copolymerisation, more than one molecule makes up the mer. Acrylonitride-butadine-styrene (ABS) is an example of a copolymer. Figure shows the copolymerisation process for ABS polymers. Many monomers will not polymerise with themselves but will copolymerise with other compounds. Copolymerisation has been applied extensively, in the artificial rubber. Condensation polymerization involves the chemical reaction of two or more unlike monomers to form a new molecule. 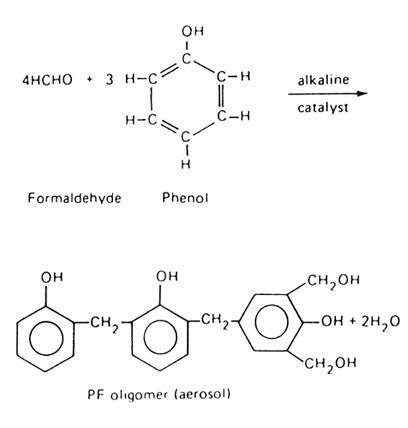 This chemical reaction produces a condensate or nonpolymerisable by-product, usually water. A catalyst id often required to start and maintain the reaction. It can also be used to control the reaction rate. The process of condensation polymerisation is shown in Fig. With some exceptions, polymers made in chain reactions often contain only carbon atoms in the main chain (homochain polymers), whereas polymers made in step reactions may have other atoms, originating in the monomer functional groups, as part of the chain (heterochain polymers).